Rightwing Rumblings: 'Durga Vahini' , VHP women's wing mammoth rally in Hyderabad old city. 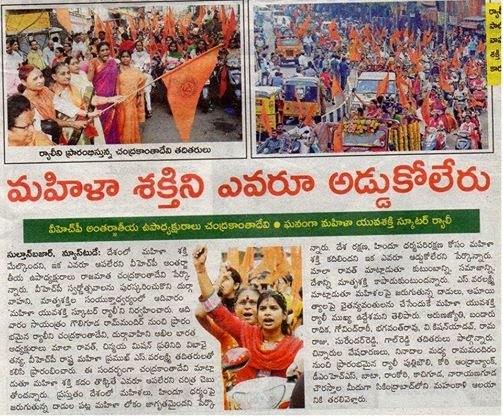 'Durga Vahini' , VHP women's wing mammoth rally in Hyderabad old city. "वह हिन्दू नारी है - पूल नहीं चिंगारी है "
Hundreds of #DurgaVahini ( Vishwa Hindu Parishad's women wing) Swayamsevika's have taken out mammoth vehicle rally in Hyderabad Old City on last sunday. Peoples of all walks of lives stood either side of the pavement to welcome the "Heroes". People gave "Aarthi" to the #DurgaVahini rally, showered flowers . Swayamsevikas carried "Bhagwa Dwaj" and sported saffron ribbons on head. The grand message of the rally was to showcase the "Shakti" The Power, of Hindu Women, make them believe in Hindutva and in our National ethos . Be strong and take pride of your Hindu Dharma , never be ashamed to say "Iam a Hindu". It was one of the rarest sight to see such a huge rally of patriotic women. Participant #DurgaVahini Swayamsevikas raised slogans of "Vande Mataram" Bharat Mata Ki Jai", "Hindu Shakti - Rashtra Shakti" and "Hindu onka Hindu Desh" ( India belongs to Hindu's) . ***For them Muslims & Christians are Hindus by Nationality. This #DurgaVahini rally showcases the fearless Hindu Women - Women brave enough to continue traditions of Rani Rudrama Devi, Ahalya Bai and Rani Lakshmi Bai. The participants hearts was as brave and daring as the stainless edge of the brave warrior's sword. The success of rally must been a worrying point for Owaisi Bro's and Muslim Jihadi elemets. The rally started at Charminar Bhagyalakshmi temple and ended at Secunderabad Mahankali temple. 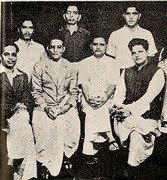 देश जागेगा - तो वीशवा जागेगा !